One of the reasons why Gesneriads are held in high esteem by professional botanists is their sometimes exceptional or even unique morphology. This applies particularly to the paleotropical Gesneriaceae, in which a considerable number of odd genera and species can be found. Long understood as odd are the so-called “unifoliate” species of the South African genus Streptocarpus that produce only a single, ever-growing leaf throughout their lifetime. Recent studies, however, have made clear that the superficially conventional “rosulate” species also exhibit a strange morphological organization. In South East Asia, the whole group of Epithematoid Gesneriaceae (Didymocarpoideae-Epithemateae) features a strange and complicated organization. In general, the neotropical Gesneriaceae exhibit a more conventional architecture, but also have a few species with peculiar morphology (Sinningia tuberosa and Lembocarpus amoenus). Details follow. In the process characteristic of subg. Streptocarpella, the seedling of Streptocarpus caulescens begins with two cotyledons, Co and co. One, of these, Co, enlarges, the other withers away. A gap, the mesocotyl (Me), develops between the two cotyledons, from which arises a petiolode with normal leaves (Ep and B). Sub-sequent development is like “normal” stemmed dicots. The large genus Streptocarpus (in its conventional sense; ca. 160 species; for its new concept see below) has been traditionally divided into two subgenera: subg. Streptocarpella and subg. Streptocarpus. The species of subg. Streptocarpella have a rather conventional structure: the plants produce elongate stems with decussate leaf pairs from which the axillary inflorescences arise. Peculiar however, is the seedling. After germination, the two cotyledons grow unequally; one, the “macrocotyledon”, finally reaches the form and size of a normal foliage leaf, the other, the “microcotyledon”, stops growth early and remains as a tiny structure without function. 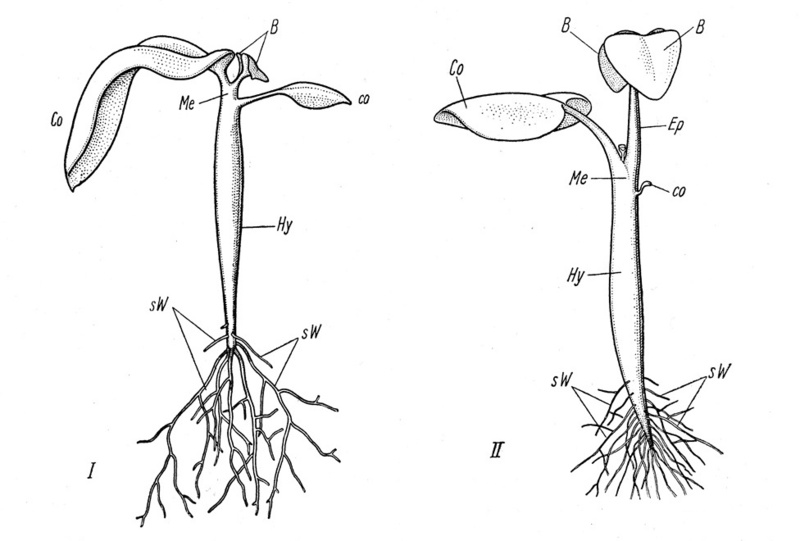 Still more important is that the two cotyledons get separated from each other by the intercalation of a distinct internode, the “mesocotyl” (Fritsch 1904, Schenk 1943). Streptocarpus dunnii is one of the unifoliate species. It is native to open, rocky and grassy places in South Africa. 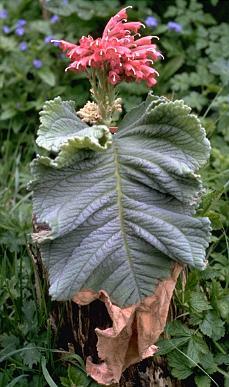 It can live for multiple years, and during the dry season part of the leaf often dies and withers away, reducing the surface area subject to transpiration. In subg. Streptocarpus a wide array of unusual morphologies can be observed. The most conspicuous is when only a single foliar organ is present. This is the “macrocotyledon”. It shows continuous growth throughout the lifetime of the plant and grows to more than a meter long in some species. Also here a mesocotyl occurs, but this remains short and develops into a thick stout stalk (“petiolode”). From the base of the macrocotyledon a series of inflorescences emerges. The macrocotyledon and the petiolode form an integrated structure which has been termed a “phyllomorph” (Jong and Burtt 1975). The unifoliate species of Streptocarpus produce only a single (= cotyledonary) phyllomorph. These plants reach maturity in two or several years. After flowering and fruiting they die. In those species living in a markedly seasonal climate, a unique mode of survival of the unfavourable dry period has evolved: the lamina sheds a large distal part through abscission. When favourable conditions return, growth is resumed from the remaining basal part of the lamina (Hilliard and Burtt 1971, Noel and van Staden 1975). The phyllomorphic organization is also characteristic of the several-leaved (“plurifoliate” and “rosulate”) species of subg. Streptocarpus. Their plant body can be considered as a succession of phyllomorphs. In the plurifoliate species (e.g. 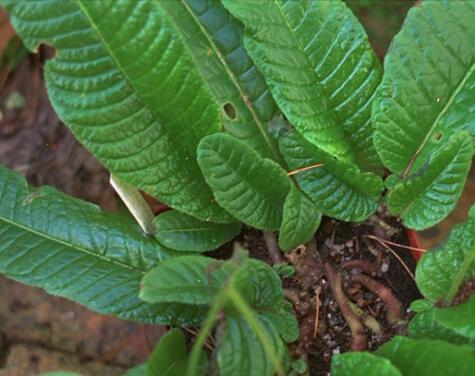 S. polyanthus) two or a few phyllomorphs are produced, each repeating the structure of the cotyledonary phyllomorph. Rosulate species such as S. rexii and S. candidus have a close resemblance to familiar rosette plants. However, the rosette is not made up of simple leaves, but of phyllomorphs with a distinct petiolode at the base. Regarding the arrangement of the phyllomorphs, two patterns can be recognized: the “centric” and the “excentric” pattern. Streptocarpus fanniniae produces creeping rhizomes which produce the phyllomorphs consisting of a long petiolode and a leaf. The rhizomes can spread to create a dense mat of plants in moist places. In the centric pattern the phyllomorphs are arranged in a spiral on a condensed vertical axis (e.g., S. gardenii, S. candidus). In the excentric pattern the phyllomorphs are arranged in two ranks on the upper surface of a horizontal rhizomatous axis (e.g., S. primulifolius, S. rexii). In both the centric and excentric patterns, the phyllomorphs produce vegetative buds on the petiolodes, and from these buds lateral rosettes or “branch rhizomes” develop. Roots arise regularly from the base of the petiolodes, so that each phyllomorph is provided with its own root system. Each individual phyllomorph of the “rosette” is monocarpic and perishes after flowering and fruiting. Recently, and based on molecular data, the genus Streptocarpus has been redefined and significantly enlarged to include all African and Madagascan genera of Gesneriaceae (Nishii et al. 2015). The inclusion of genera such as Saintpaulia, Linnaeopsis, Schizoboea, Nodonema etc. makes the morphological picture much more complicated. Moreover, the study demonstrates that homoplasies, e.g. the acquisition of the rosulate, phyllomorphic or unifoliate habit, are more frequent than previously thought.